when you click on the photo. 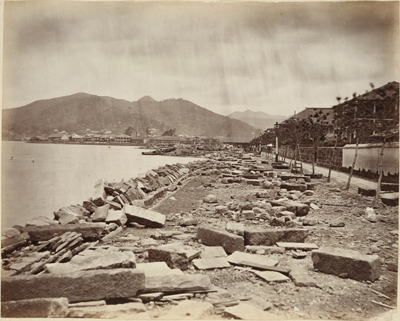 This is a photo UENO Hikoma took of the Oura Bund just after the typhoon of August 20, 1874. The rubble of the destroyed sea wall lies scattered across the boardwalk. The wooden customs building that had just been built at the tip of the area has been swept away and we can see a boat tossed onto the land. The flagpole at the Dutch consulate at Dejima tilts precariously to one side and the roof and windows of the consulate are damaged. Copyright 2017 Nagasaki University Library. All rights reserved.